When an outbreak of disease at a duck farm in 2010 at Cygnet River on Kangaroo Island, South Australia (Australia), killed 128 out of 128 ducks within three days, scientists weren’t duly worried. 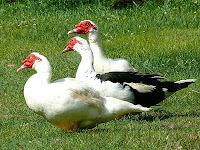 The ducks had been incorrectly fed during a week-long absence of the owner from the farm. The ducks were lethargic, had diarrhea and the mortality rate among infected ducks was high. Antibiotics did not have any effect and everyone agreed that the disease was probably caused by a virus. But when the scientists tried to find out which particular virus it was, they were in for a surprise. They identified a novel orthomyxovirus from these Muscovy ducks in South Australia and, as usual, it was named after the location of its discovery: Cygnet River Virus. The discovery of this virus provided supportive evidence for the creation of a new genus within the family Orthomyxoviridae. The family now comprises five known genera (Influenzavirus A, B, and C, Isavirus and Thogotovirus) and one tentative genus (Quarjavirus). The proposed genus Quarjavirus contains the three virus species: Quaranfil, Johnston Atoll, Lake Chad viruses, and, now, a fourth member: Cygnet River Virus (or CyRV). Quaranfil virus, a human pathogen that caused a mild febrile illness in children in Egypt, and Johnston Atoll virus, a tick-borne virus of birds were determined to be orthomyxoviruses. All known Quarjaviruses are tick-borne, so ticks may also play a role in the transmission of CyRV. But this also shows the versatility of orthomyxoviruses and we must be eternally vigilant for any possible threat these viruses may become to humans.